NVHS Fundraiser hosted by Alex and Ani on Dec 1! Get all of your holiday shopping taken care of while helping cats in need! Please join us for this wonderful fundraiser organized by Alex and Ani for NVHS. 15% of all purchases on this day and time will be donated to NVHS! You can even go to ALEXANDANI.COM to create your Wish List before the event and bring it with you that day. You can call them too, to make sure they have what you’d like to buy in stock, and they can help you with your Wish List. They accept cash and credit cards, no checks. We hope to see you there! No RSVP is needed. You can email nvhumanesociety@gmail.com with any questions! 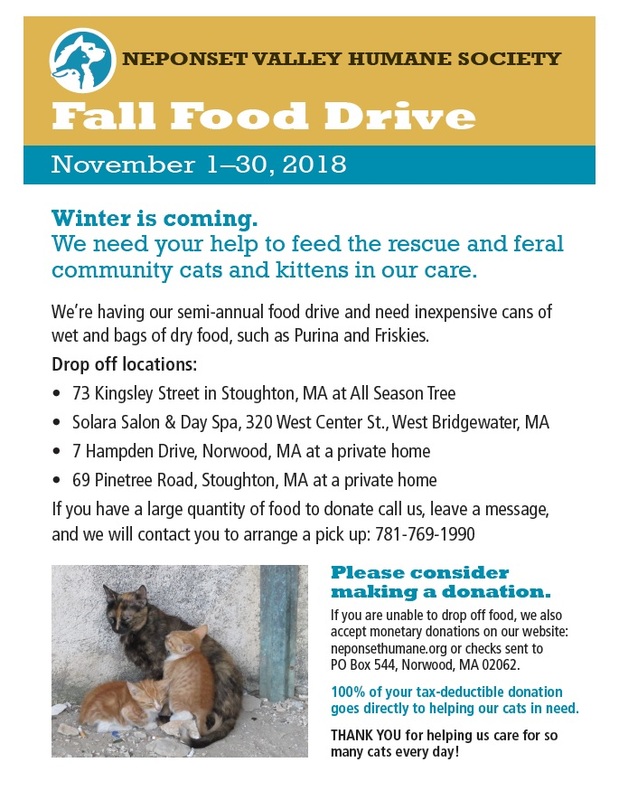 Fall Food Drive – 2018!